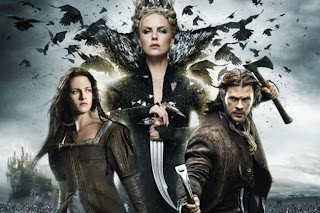 “Snow White and the Huntsman” is probably best described as medieval fantasy adventure based on a popular fairy tale. It suffers from a common problem with adaptations of stories we all know – how to keep it interesting despite the fact we know what’s going to happen. Often this is solved by throwing the story away and just keeping certain elements. And in part this is that happens although the spirit of the story is kept with a few liberties taken with details. But this means there are very few surprises in terms of the plot. Where the main surprise comes from is seeing big name actors (okay, big name British actors) as the dwarves. If you are going to have Ray Winstone and Bob Hoskins in a movie, don't make them dwarves unless they're hardened East End dwarves out to blag the Bank of Middle Earth. And I'm pretty damn sure that having full-sized actors play dwarves is exactly the same as having white actors black up. This more than anything made me feel uneasy about the movie. That and the fact that purity seemed to be a trait of royalty alone. Those and the fact the genre veered from fairy tale to medieval adventure to Narnia-style pseudo-religious fantasy road movie to Christian allegory to Joan of Arc knock-off to big-budget supernatural action movie. With a Shrek ending. The Lion/Witch/Wardrobe segment stuck with me the longest, with the cameo from the Aslan-style hart (why was that there again? ), and the classic mythological (and now very Christian) concepts of a redeemer who must die to save us all. I enjoyed how they wrestled with making a movie about a story we all know, but can’t say I was engaged. I found it hard to care about anybody in it despite the best efforts of the film makers. And as for the central relationship, as dictated by the title, I found this highly under-explored. Especially as I was wondering the whole time what would the child of Snow White and Thor be like? What powers would it have? And if the three of all went back through the wardrobe to 1940s Britain, how awesome a movie would that be?